The fixity or mobility of borders are key themes within the border studies literature and have useful critical application to urban and environmental planning through theory, pedagogy and practice. This offers potential for transformative change through the processes of re-bordering and re-orienting established boundary demarcations in ways that support and promote sustainability in a climate of change. 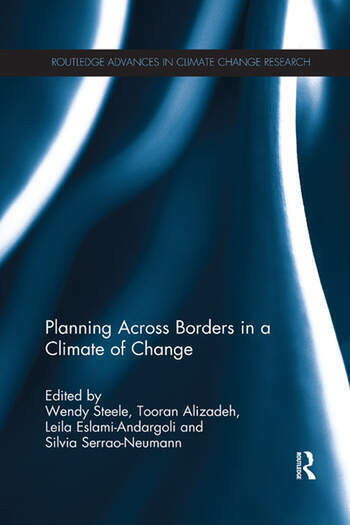 Planning Across Borders in a Climate of Change draws on a range of diverse case studies from Australasia, North and South America, Europe, Africa, the Middle East and Asia and offers the application of border theory, concepts and principles to planning as a critical lens. It applies this lens to a range of international case studies in key areas such as climate change adaptation, food security, spatial planning, critical infrastructure and urban ecology. This collection fills an important gap in the border studies literature, bringing climate change considerations to bear on planning. It should be of interest to students, scholars and professionals in the field of urban and environmental planning, climate change adaptation, border studies, urban studies, human and political geography, environmental studies and development. Wendy Steele is an Australian Research Council (DECRA) Fellow and Associate Professor in the School of Global, Urban and Social Studies and Centre for Urban Research at RMIT University in Melbourne, Australia. Tooran Alizadeh is a Lecturer in the School of Environment, Urban and Environmental Planning Discipline at Griffith University, Australia. Leila Eslami-Andargoli received her PhD degree from the school of Environment at Griffith University, Australia. Silvia Serrao-Neumann is a Research Fellow for the Corporate Research Collaboration for Water Sensitive Cities (CRC-WSC) at the Urban Research Program, Griffith University, Australia.